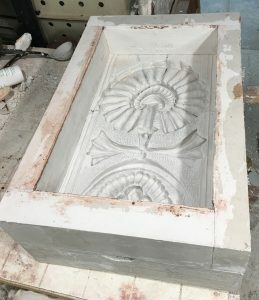 The plaster-piece mold for this is done, waiting for the last section to set before taking it apart, and finishing up the last segment of a time-lapse video of it. It took 125# of plaster and some 7 gallons of water, about half of that water will evaporate out. It will be probably 2 weeks with fans blowing on it to dry it out enough to use for pressing the clay into. 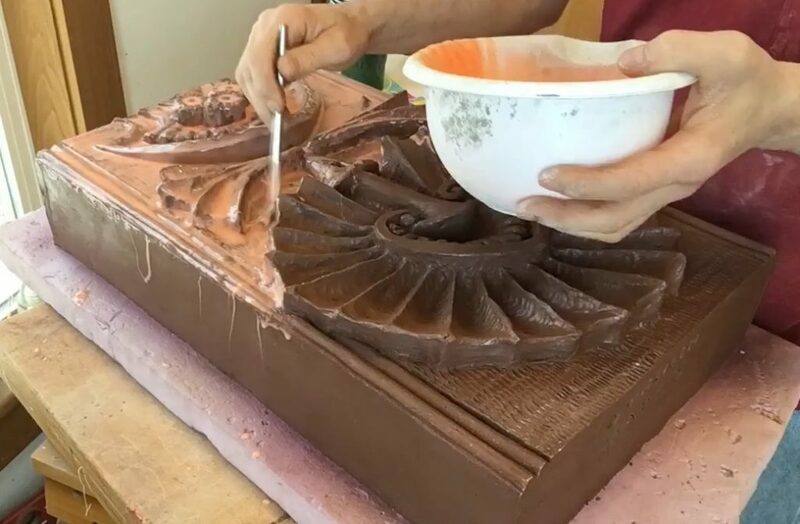 This is exactly how the working molds were made for all of the Elmslie “Sullivaesque” terracotta, and all of the similar architectural terracotta as well. About the biggest difference between then and now is only in my using a rubber positive copy instead of taking this plaster mold directly off the original clay model. 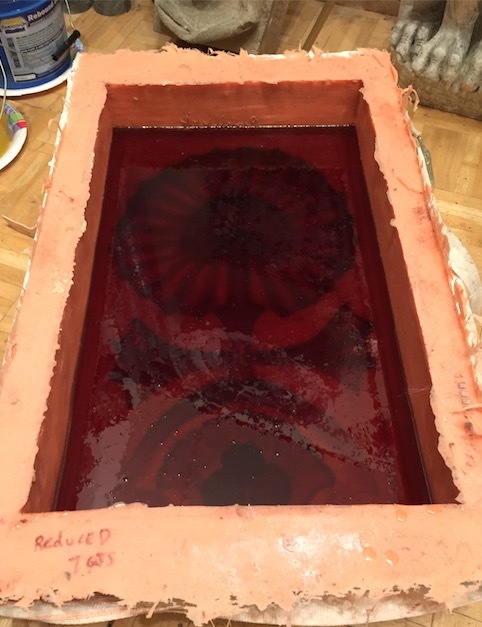 With the rubber positive I could make additional or replacement molds from that whereas the clay original master is typically destroyed in the process. Back in the old days these kinds of designs were typically custom made for each building job, so they tended to only need a few of each, a dozen maybe. 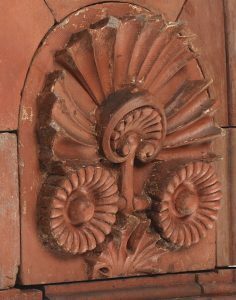 If they made terracotta cornices and windowsills, these were typically made by extruding the clay thru a die under mechanical pressure for small ones, for larger ones they used a system of running a template along the clay which was the same way they did the elaborate plaster ceiling crown moldings- shaped in place using wood runner strips and templates. 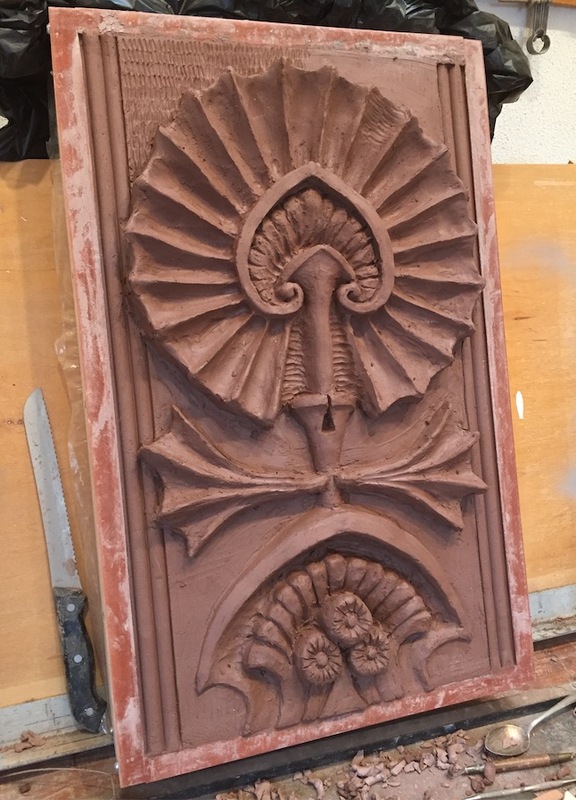 Elmslie Scoville design mold completed. Elmslie Sullivanesque James Scoville building artifact update. 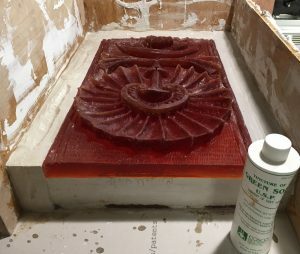 Now that I have the materials needed, I’ll be making the mold required to produce this historic model in hand-pressed kiln fired red terracotta this weekend, it will be a few weeks before the first one can be produced. I printed out the two full sized reference images I need for the two planned models, a tape measure opened to 24″ is for visually scaling the sizes in the image. 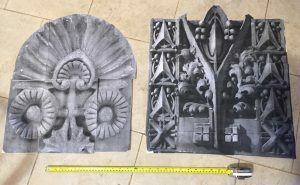 The one on the right is a W-1 pier capital design from the Washington Irving school, Hammond Indiana, the one on the left is a lunette design from the James Scoville building in Chicago. 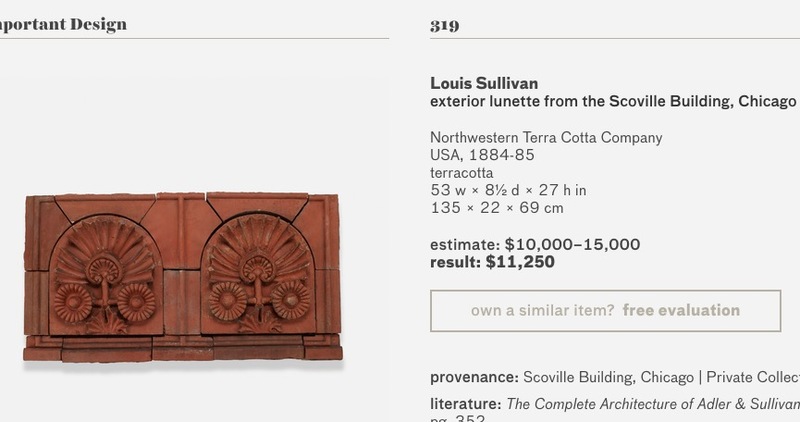 The Scoville lunette is from an assembly of two that were sold at an auction outfit for some $15,000, while the pier capital from the 1936 Hammond Indiana school was designed by George Grant Elmslie and William Hutton in the Sullivanesque style by Louis Sullivan. 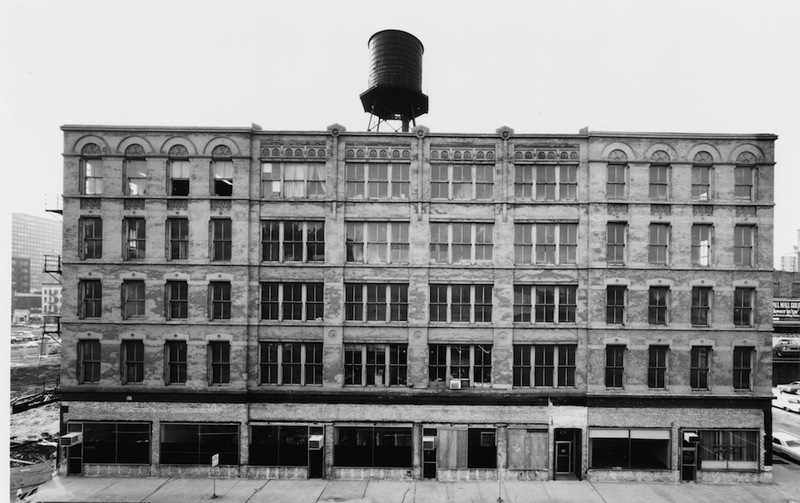 The school was demolished in 2003 and this particulat artifact resides at the city museum in St Louis. I found some great photos of it that were taken by a photographer on a photo sharing site, after I inquired about the artifact’s dimensions he very generously uploaded 109 photos to an album for me to download and see, the 109 photos were all taken of artifacts in the city museum’s collection of Elmslie/Sullivanesque artifacts and others, a real treasure trove and there’s other designs I like that I may also make models of at a later date. The pier capital will require a little thought as it was originally a 20″ cube, with all but about 5″ of it embedded into the brick wall, the sides of it that were visible had the same triangular designs as the face does, so that presents a couple of issues to decide on, for the interior cast stone the casts dont need to be deep as they would hang ON the wall, but I plan to do these in terracotta and those could be embedded INTO a wall, so if I retain the original configuration of the sides having a design instead of being flat, then I would have to make this considerably deeper- say 7-8″ deep so about 4-5″ can project out while 3-4″ would be embedded, we’ll see what I decide on that, meanwhile I will probably start the Scoville Lunette model first. 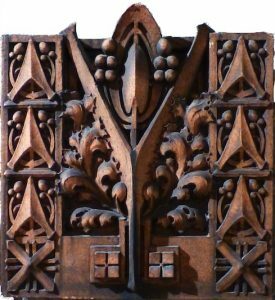 As I look around in google and flickr’s images, there’s certainly no lack of a large variety of Sullivan & Elmslie designed architectural terracotta, both pictured on building facades as well as stripped-off artifacts such as those found at the City Museum in St Louis from demolitions. As I find interesting designs that I like and think will sell, I’ll be working on more models of these unique and interesting designs. 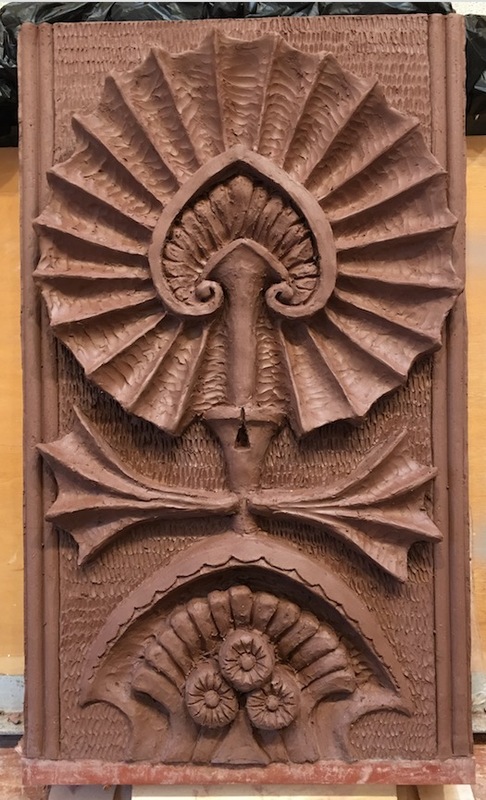 I’ve already identified at least two pieces I want to model next, the first one was from the same James Scoville building as the recently finished design with the webbed lotus leaf design. I’ll probably work on developing the design and starting the model of the main section of the above in the next 2-3 weeks, I may make the side pieces as well since it’s MUCH easier to make them and have them fit properly if they are done together, it would take 10 different uniquely shaped moldings for the surround, but they were nothing but flat blocks with a half-round design on the surface acting as a nice visual border. 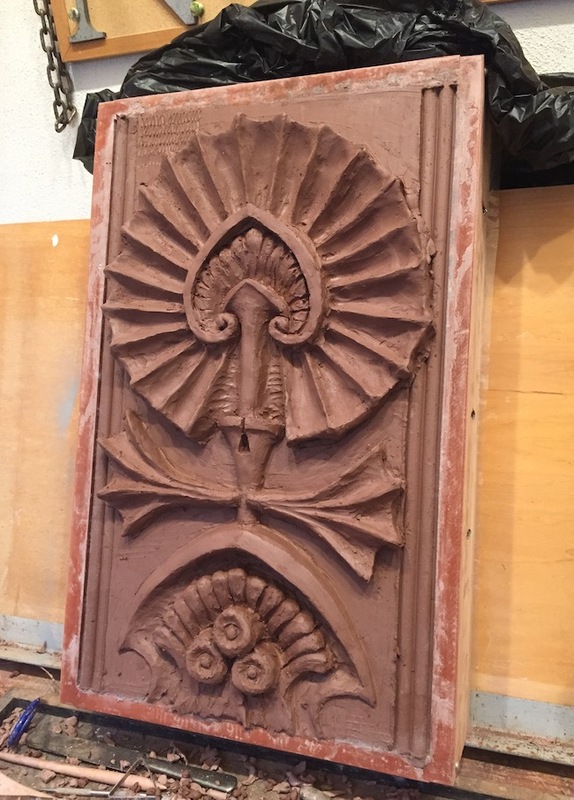 Probably when it’s done in fired red terracotta the pricing for each main motif sans the borders will run around $325, but it will be available in interior cast stone as well. The borders will be modelled and stored away in case a client wants them, I won’t automatically just make molds of those as there may not be any interest in the border pieces. The other design I liked is at the City Museum in St Louis MO., I once went to St Louis to visit a friend of mine there, and to exhibit at a dog show sponsored by Purina, my hotel was some distance from the show grounds on the Purina property, but I visited St Louis. 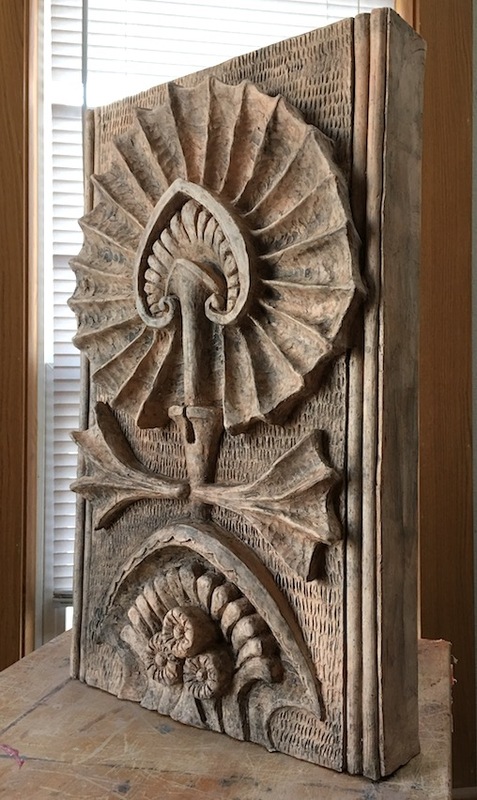 So this is a pier capital from the Washington Irving public school that was demolished in Indiana, it was about 20″ square, with an interesting repeated design. I’ll be starting a model of this soon as well. 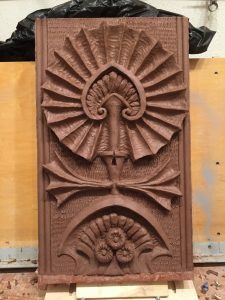 Probably when it’s done in fired red terracotta the pricing will run around $325, but it will be available in interior cast stone as well. 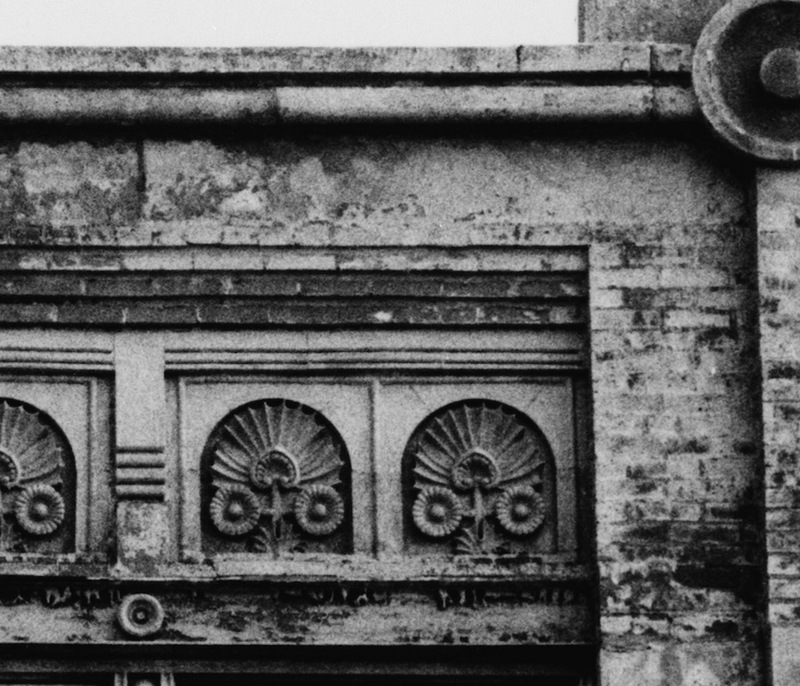 The Virginia Museum of fine art which has a few artifacts from this building also has at least one of these lunettes with a very similar design on it as the spandrel panels have. I like the shape of it as well, I have no plans to but easily could make the surrounding flat pieces for it if a client wanted them. I will be working on this model very soon, of course it takes time and this type of work is done when I have time, and more time for the various mold making processes to get done, but progress photos will come along here soon enough. This would most likely be priced around $325 in fired red terracotta. The museum has their artifact sized 18-1/4″ x 18-1/2″ and 4″ deep, this size would fit into my existing kiln, so this is another design I can keep my model of full sized like the originals and offer both interior cast-stone this size but less deep to hang ON the wall, and hand-pressed terracotta which will be slightly smaller due to the shrinkage of the clay but made a nominal 3″ deep which can be additionally used outdoors in the garden or embedded into a brick or stone wall of any type. The artifact they have is a gift of the Metropolitan Museum of Art. 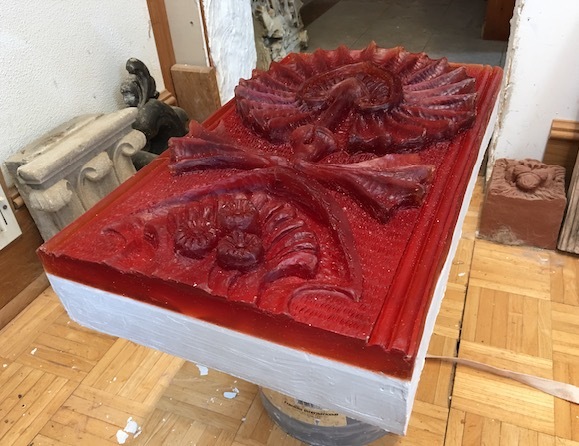 I just ordered the two gallons of pourable mold rubber I need to “convert” my “Sullivanesque” design that was recently finished- into a form I can take a plaster piece mold from for pressing terracotta into. 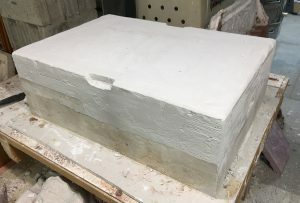 Two gallons is not enough to fill the mold, it is only enough to pour about 1″ deep, the rest of the depth will have to be plaster to save on the costs of not having to buy two more gallons of expensive rubber. 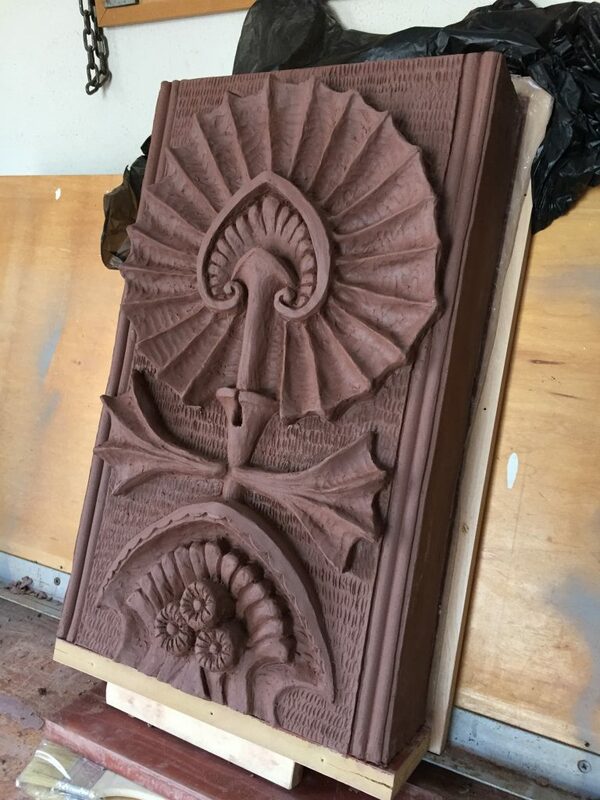 Louis Sullivan Sullivanesque mold finished, and a timelapse video. I also cast the first interior cast from the mold and gave it a weathered antiqued wash so I could get a photo. It will be available in brick red, kiln fired terracotta as well. I’m finished with this Sullivanesque model now and plan to start making the mold to-morrow morning. it’s moist clay, somewhat firmer than it was as it started losing moisture, but it’s still delicate and a paint brush can leave marks on the surface so I have to almost flow the first coat of rubber on rather than firmly brushing it on. I wanted to get the mold made before it dries since as it dries and becomes completely dry the clay shrinks about 15%, and then when pressed clay copies are made those would also shrink almost that much, so the double shrinkage of about 25% would seriously reduce the final size which I want to avoid by doing hte mold while it’s still moist and nearly the same size it was when I set it up. More detailing is roughed in as is the background texturing, the clay needs to firm up a little before I finish it up. Hope to get that done this week and weekend, and make the rubber mold next weekend. The model is nearing completion, still a fair amount of detailing and cleaning up to do yet, but here’s the progress to date. A timelapse showing some basic rough texturing of the model’s background. Some more progresss for today! There will be an interior cast-stone version available first.